Card: Two of Wands – from the Circle of Life Tarot by Maria Distefano. Message from the Faeries: Last week the wands appeared, and they are back again this week. Wands are the element of fire, and they represent the alchemical and creative energies. This is very much a time of change and transformation. Right now would be a good time to be doing some sort of creative project. 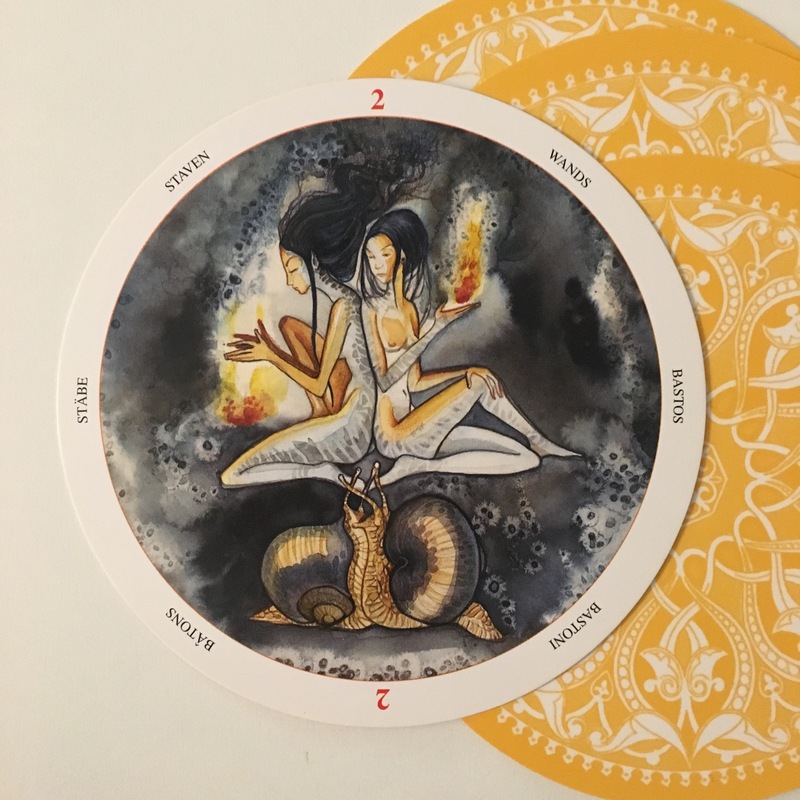 In the imagery of this card, there are two women with their backs to each other. They are both working with their own separate fires. Imagine what would happen if they were to face each other and share their creative energies. A partnership may not only increase their productivity, it might also allow them to learn and share new ideas. Sometimes it can really pay off to work on important projects with other people. If you don’t want to work with other people, it could also be valuable to ask someone to look at your work and ask for their feedback. Another aspect of this card is the number 2. There is a duality expressed in this imagery, not only with the two faeries, or the two snails, but also with showing the the contrast of the light and the darkness. As the days are getting shorter there is a movement closer towards more darkness. It’s okay to spend some time exploring your shadow sides if you feel so inclined, just remember to keep it close to the light. 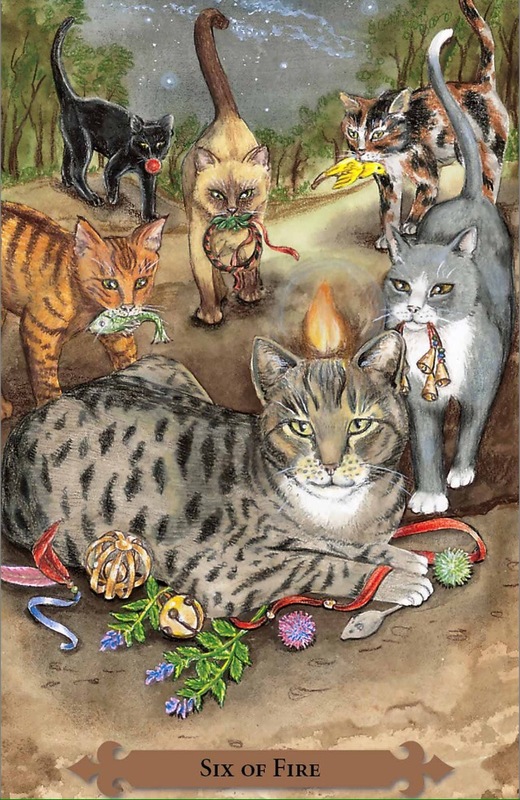 Card: Three of Fire – from the Mystical Cats Tarot by Linaea Weatherstone. Message from the Faeries: Are you curious as a kitten? Are you a questioning cat? Are you an enquiring feline? If the answer is no, then you might want to consider turning that into a yes? Being curious leads to new adventures and takes you closer to your destination. If you had no curiosity, you would live a pretty dull and boring life. It’s your curiosity that then leads you to doing new things or trying something exciting. The cat in this picture sees something that has caught her attention. She wants to jump up and see where the shining light is coming from. She’s going to jump at it without much thought. Cats are impulsive and sometimes this is to their detriment, but often it leads to something fun – or maybe the shining light turns out to be nothing. Either way, they aren’t afraid to jump in and find out. The element of fire in this card is about a passion or a creative endeavour. Whatever it is that you feel drawn to or interested in this week, don’t be afraid to jump in a try. The odds are very much in your favour right now. If you are thinking about trying something new, just go ahead and do it. If there is someone you want to ask on a date, don’t be afraid to ask them. Just do it. You really have nothing to lose. Be brave and take the leap. Whatever you decide to jump into this week will lead to something great. Everything is lined up right now to move you further down your journey. New endeavours will bring you to many opportunities further down the road. Even if you find yourself in a bit of a tricky situation after you take your leap, it’s still exactly where you were meant to be. It’s still a step in the right direction, even if it feels like a misstep. Unfortunately, dearest Erin is under the weather this week. Hopefully a little more bedrest will bring her back to well-being once again. So thank you Erin for offering me an opportunity to do the reading for you. And, as you’ve seen in the January readings it appears to be the month of 1’s continues the journey for us. 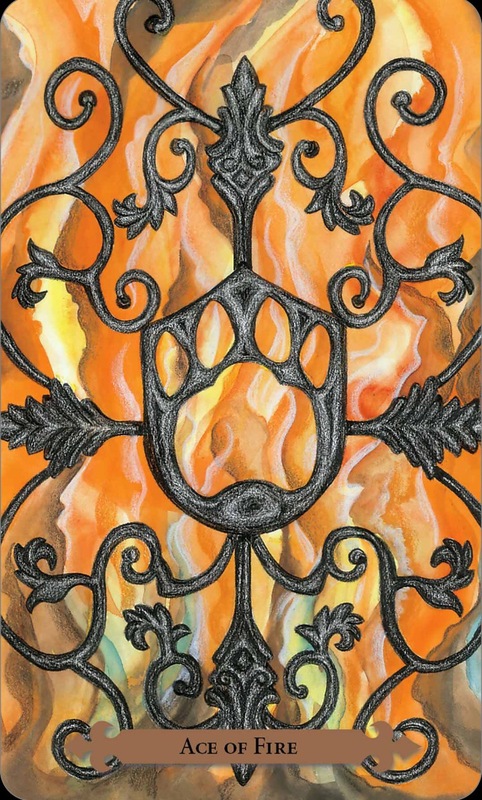 The Fire Cat clan emblem and gate stands before the fiery flames and offers you a choice as to whether to enter beyond the gate or not. If you the seeker choose not to enter then this is so. However, choosing to enter we move beyond the gate and embrace the support of our internal flame and or that of those who are on the journey of creation with us. Creation burns through the layers that hinder our heart and soul and then free us to explore our world in new and exciting ways. Creativity opens us to personal growth and to see beyond our Earth bound body. It reminds us that we have the potential to create all forms of energy when we take the time to move beyond our internal gates, which allows our own fire to shine! Our fire takes many forms through creating foods, dancing, visual, written, audio and tactile arts, and athletics to suggest a few possibilities, which are potentially limitless. Our participation on an individual or community level encourages creativity and passion to expand on all levels of being in this universe, and includes activism. Once you embrace this internal/external fire anything is possible for the outcome. I ask you to Believe it serves the greater good for one’s self or community, no matter the outcome. Be open to embrace the creative flow of your fiery dreams, passions and beliefs and expand yourself this week. Create something new in your life and world. Find joy and pleasure in this creative process and you will be rewarded. You are a Fire Clan Warrior, however it looks embrace it! Power week! Meeoww. This week’s reading is done by wonderful my mother. Thanks Mom! Dear Ones, this week the Goddess of Cats asks you to spend some time looking within, then stepping out. She tells me, that to often you negate your personal gifts, your beauty and your heart of gold. Her message to you is that you are a worthy and valued member of the human tribe. And it is time for you to step forward and share the light you carry within. Yes, this means you can safely step up to guide, encourage and support those around you. Those beings that may be struggling or not sure of who or what their role is within the human tribe. Or perhaps do service for the four-legged , the water or air beings or other earth beings. For you it is a time of accepting the love, friendship and gifts offered to you. This then creates an equality of feeling and respect shared between you. This time is not about ego though. You are about to embrace your diversity and acknowledge or assist other to see their own light, beauty and gifts. Be grateful for these relationship experiences and what is bestowed upon you in all ways. Your leadership is paramount in whatever form it takes this week, it may even be subtle in nature and at the same time it is greatly worthy and valued. Be your best, be open this week for opportunities to be in relationship to all beings. This is all that I ask..Goddess of Cats. 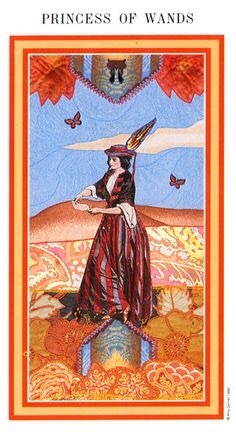 Card: Princess of Wands – from The Enchanted Tarot by Amy Zerner and Monte Farber. Message from The Faeries: It’s time to tap into your fiery side! Time to let your inner spark to light a flame within. No more sleepy slumbers of the winter. Spring is almost upon you, and so it is time to come out of hibernation. Let the Princess of Wands inspire you this week. She’s a very energetic young woman who is full of passion and life. Always on the go, she doesn’t let anything stop her. Sometimes, of course, her fiery personality can get herself into trouble, but her enthusiasm can not be beat. She is often able to demonstrate to others that despite her exuberance, she has the best of intentions. Pay no mind to what others think: This week isn’t about anyone else but you. Your energies have been lower than usual lately, and this week that is all going to shift. You have to do some of the work though. Be sure to get lots of fresh air and try to exercise a little bit. Go for short walks and move your body. Like the tree that’s been asleep all winter, it’s now time to get all your sap flowing. Soon you will blossom into your vibrant summer-self. If you find yourself in the sunshine, bask in all of the Sun’s glory. Let the rays flow into you to help your inner fire to grow and give you life energy. We also recommend that you listen to some of your favourite music and let it inspire you to move. Get your blood moving. 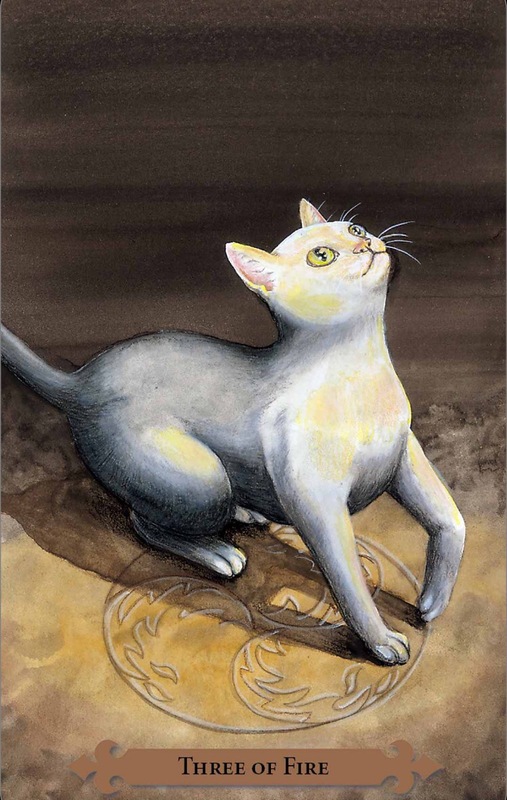 Card: Four of Fire – from the Mystical Cats Tarot by Lunaea Weatherstone. Message from the Faeries: One of the reason why Christmas time and the holidays can feel so magical is because you give yourself a break from humdrum of your day to day life. If you think about it, you also perform certain special rituals this time of year. You might cut down a tree and decorate it. You might light special candles. You specially select or make presents and wrap them. You cook special food for family and friends. These rituals are what make Christmas magic. This magic, of course, is enhanced by all the love and well wishes that is shared this time of year. It is so wonderful that so many of you take this time of year to be with loved ones and share in ritual. Your ancestors have been doing this for a very long time, and it’s a very important part of the year-cycle. It’s the best way to end a year and start a new pattern for the year to come. Some people like to downplay the importance of ritual, and some people have outright removed it from their life. We think this is unfortunate. Even if you don’t believe in God, Jesus, Santa or any religious anything, it doesn’t matter. Ritual is important. All your action carries an energy. Ritual is just a way of expressing your energy, or tone. The intention behind the energy is put into the physical which will create a reaction. It’s very basic science, really. While all of the gift giving at Christmas can be waived off as Capitalism at its worst, and there is truth to this, there is a greater force at work at the root of it – Love. Open your hearts and receive the love of this special time of year. Give love and receive love with big open hearts. Help set the tone for the new year, and try not to get too caught up in your inner child drama that tends to surface this time of year. Do you really want to ring in 2016 with your inner child having a temper tantrum? Go out and have fun over the holidays. Spread joy and good cheer. If you stay home, fill your home with good music and warm food. Comfort your soul with things you enjoy. 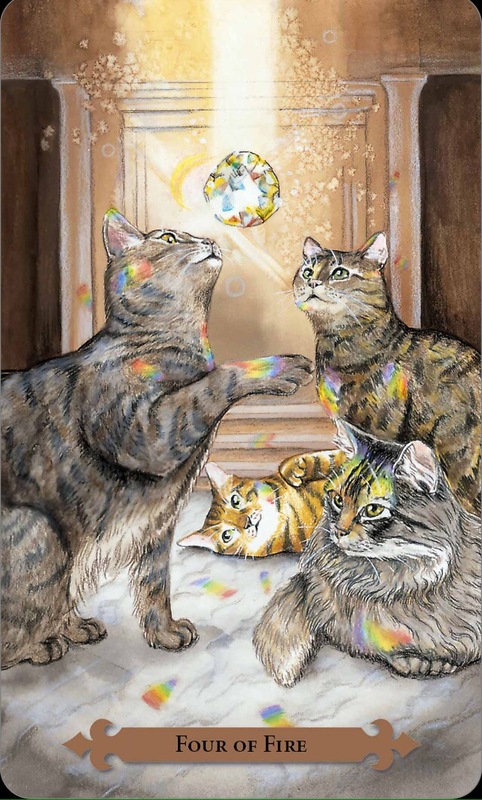 Be like these magical cats in this card. Spread the love with your inner joy and have fun. If you feel the magic, let it shine.